Close to 50% of citizens refused to participate in the last election for the President of the United States. That is their right. But the cost, ever more apparent to the entire world, is not only painful, it is far more damaging than we can imagine. Our right as citizens is one of the greatest gifts we have been given. To choose not to exercise our right to vote is the ultimate disrespect all of those whose sacrifices have given it to us. 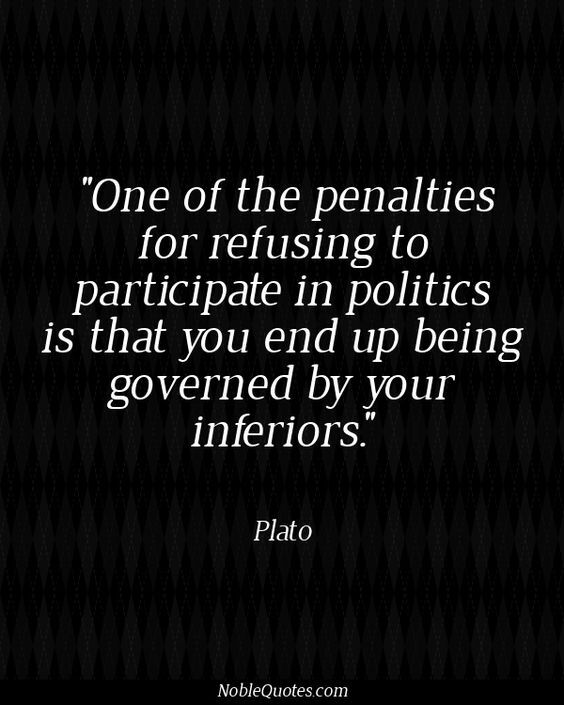 Choosing to not participate, even at the most basic level, in politics is what guarantees that we have the government we deserve. This entry was posted in News & Views, Quotes and tagged citizens, disrespect, election, game, gift, government, inferiors, NobleQuotes.com, participation, penality, Plato, playing, politics, President, quote, sacrifice, taking action, voting, watching on April 7, 2017 by Ray Buchanan. "Ray Buchanan founded Rise Against Hunger (formerly Stop Hunger Now) and retired in 2015. Comments made on this site are the sole expression of the author, are not made on behalf of the organization, and do not necessarily reflect the views of the organization."